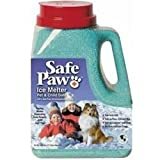 Safe Paw is the safest ice melter to use with pets. 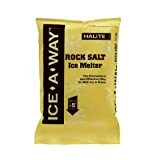 Works better than most ice melters and requires less product to do the same job! 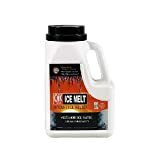 This non-toxic ice melt is guaranteed safe for pets. Concentrated pellets cover twice the area of rock salt and will not irritate pets paws or skin, and work in temperatures as low as -2 degree farenheit. Timed-release formulation helps prevent re-icing for up to three days. Guaranteed non-toxic. Safe for animals, children, vegetation, and concrete brick and stone. 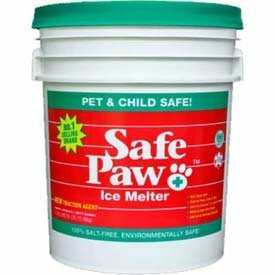 Safe paw is available in the 35-pounds size. Active ingredients are carbonyl diamide and a glycol admixture. Measures 15-1/3-inch length by 12-1/2-inch height by 12-1/2-inch width.